There's not a day goes by that I don't receive a message bemoaning Facebook changes or chat to a fellow blogger who has decided to toss in the towel on that social media platform altogether. Many blame Facebook algorithms and, to be fair, they are unfairly biased against those that don't shell out a fortune for sponsored ad placements. Well what if I told you that you could multiply your Facebook reach exponentially in just 3 simple steps without paying a penny? Before I lay out this simple yet gob smackingly effective technique let me say this; I have nothing against bloggers or businesses ploughing their money into Facebook advertising. Nothing. 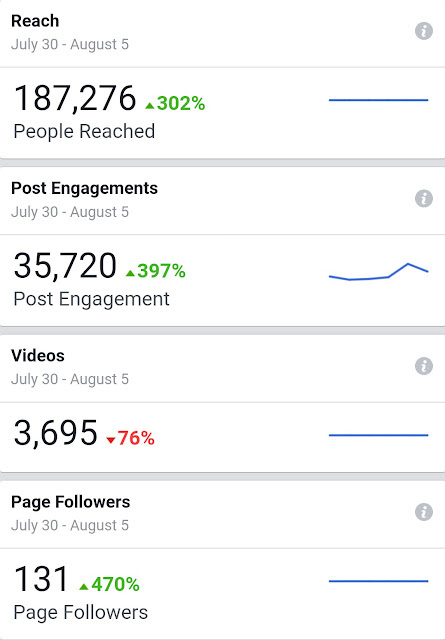 The simple fact of the matter is, Zuckerberg favours that method of using his platform (naturally) so you will see that those that do invest weekly or even daily will amass huge numbers of Likes and engagement in a relatively fast time frame. Those that invest in Likes by other means are not going to have any engagement at all. For me though, if I can explode my outreach with just a few steps and more importantly make my Facebook platform an entertaining page to engage with daily, then you best believe I have more important (& shiny) things to spend my hard earned eurobux on. That's just me but I have a feeling it might be you too. Second point to note, these are not trade secrets, they're merely a way for me to pay it forward in the blogging community because that's what we are, a community. I'm a firm believer that a rising tide raises all boats and since I began blogging almost seven years ago I've been working every single day to rise that tide for all of us. Of course I'm not alone in that but what I'm saying is that if you can help a fellow blogger out, please do. I don't get less because you get some and you don't get less because the next blogger gets some too. Step One: What do your audience want? Finding out what your audience want really IS that simple. Just as with blogging you should always keep a tab on your analytics to see what people are responding to. 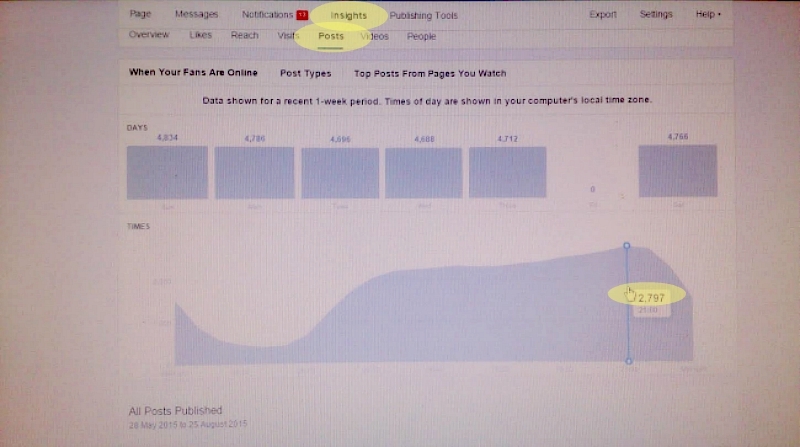 On your business or blog Facebook page those analytics are called Insights. 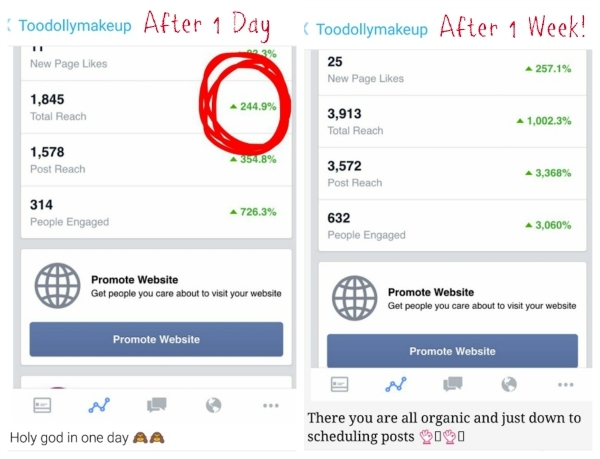 In order for this Facebook method to be its most effective you're going to want to know at what times people are visiting your page most. That way you have a baseline as to when to post and get the most outreach for your work. Makes sense, right? Most pics here are screen grabs so bare with me, ja? Find the highest peaks in your visitor numbers, they'll correspond to times and jot down your top three times. If you don't want to do this step, Breakfast (8am), Lunch (1pm) & Dinner (6pm) are always a good start too. Step Two: What do I post? You can post any multiple of the three types of posts daily (3, 6, 9, 12) but it's best to concentrate on your most active times first. First up, your own blog content should be your number one priority. I use NetworkedBlogs to automatically post my blog posts to Facebook. Since I create original blog content every day that means that once a day I'm automatically sharing my own content with links back to my blog. Even if readers don't click your link at first, they will have seen your post on their timeline. This ups the chance of them tagging or sharing posts that are relevant to them too. That's zero effort outreach juice. Try to remember that new likes to your page and your blog might not have seen a post you worked your tuckus off for in the past. 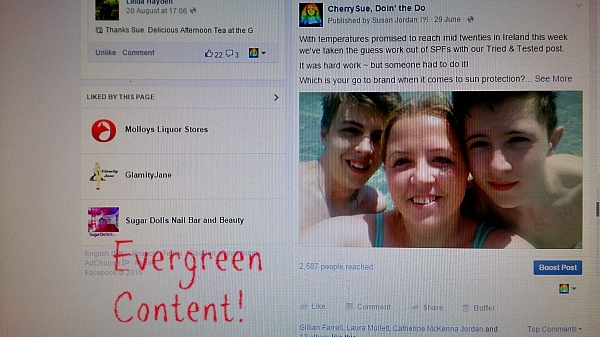 Evergreen content is content that is always relevant; take this post on SPFs for example, always relevant and popular in summer months. Look how many people saw that in one day of reposting! Always try to work smarter, not harder so allowing those older blog posts to bring home the bacon too makes sense. If you are resharing your evergreen content (say once a month), choose a different picture and caption each time. It helps to draw new attention & keeps your page content looking fresh. 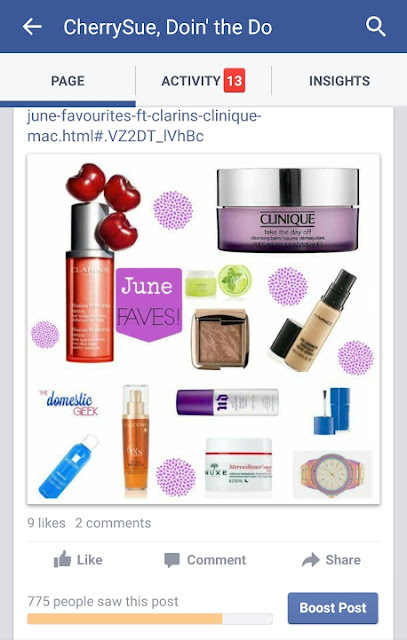 Facebook LOVES curated content. 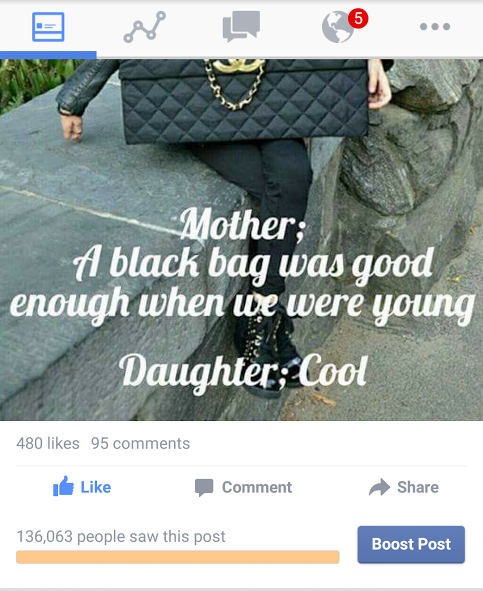 That's sharing other peoples' posts. A great rule of thumb in choosing what to curate is to look for posts that you wish you'd written or you wish you'd shared yourself. That means it's already a great fit for your audience. To keep in with my blog schedule, on Tuesdays I try to curate travel related posts, on Fridays it's movies but every day it's positive and feel good content. The third C is my favourite of them all. Community Content. That simply means getting people involved in what you're doing. The above meme I found on one of those Instagram aggregate accounts but do you see how I related it back to my page? Ask questions, encourage the chats and get involved yourself; your readers are real people and for the most part they're pretty sound ~ get involved and see what happens to both your outreach AND your outlook! 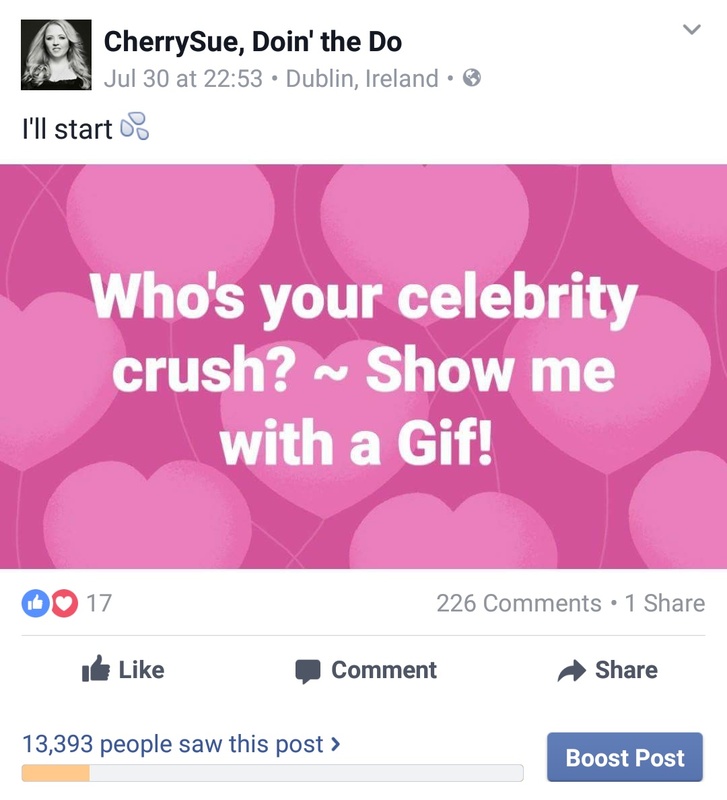 Unleash the power of the Gif! Never underestimate the power of a timely funny picture, if you find yourself laughing at it on your timeline, your community will too. 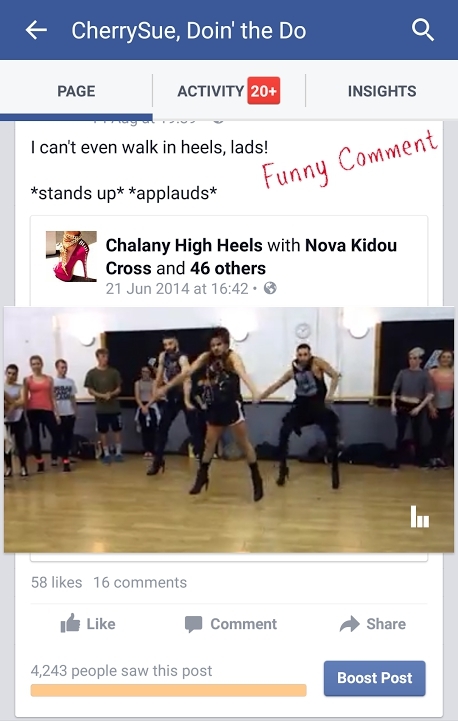 Share funny finds immediately, to bolster your scheduled content. I can already hear you thinking you haven't got the time for this. That's Step Three. Step Three: Schedule Feckin' EVERYTHING! 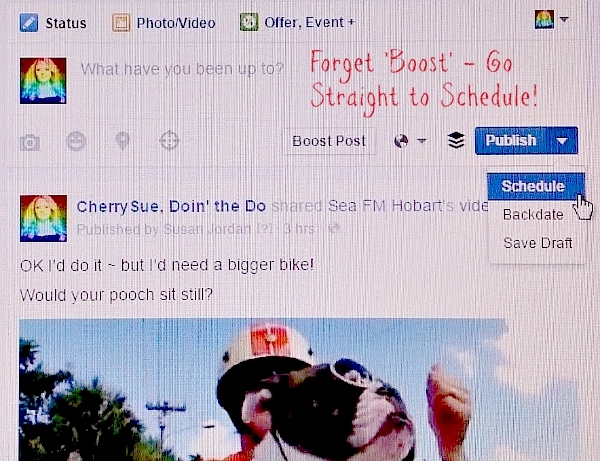 Did you know you can schedule Facebook posts? I didn't before I started upping my posting game and judging by the past week of Snaps and messages I wasn't alone either. Scheduling is your very best friend when it comes to getting the most outreach juice for the least amount of time or effort. There's a click down right beside Publish where you can say hello to your little friend. Maybe take a quiet hour at the weekend and schedule the week ahead's posts to see what I mean. Then be pleasantly surprised as the notifications begin to pile up as if from nowhere several times a day! & schedule the lot - SIMPLES! The cherry on top of my Facebook scheduling is the auto posting of my Instagram pictures to my page. Again, my Instagram has a theme specific to me and my particular brand. It's Bright, it's Beauty, it's Humour & it's ALWAYS positive. It's quite literally life with a cherry on top (Click HERE to see what I mean). Sticking with your brand's theme on Instagram will not only do wonders for your Instagram numbers (I could do a post on that too?) 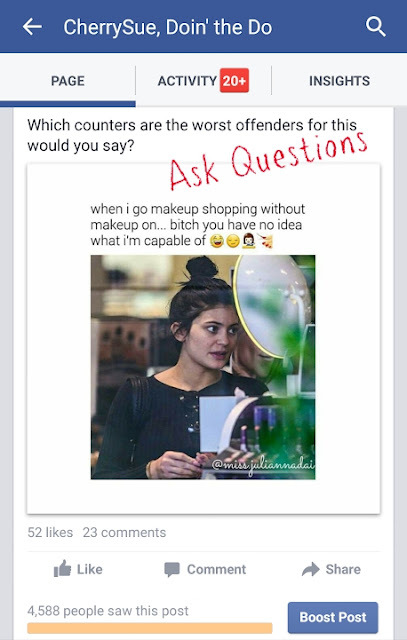 but once those pics are cross posted to your Facebook you multiply the reach of that picture including your mini-review/micro-blog attached exponentially! All without ever paying a cent. So c'est ca; you now have all the tools you need to skyrocket your Facebook and ultimately your blog outreach without ever boosting a post or cursing poor Zuckerberg again. I would genuinely love to hear if you've put my method into action, it took quite a while to tweak it down to just three steps having seen countless webinars and having read never ending content to get the answers I needed. 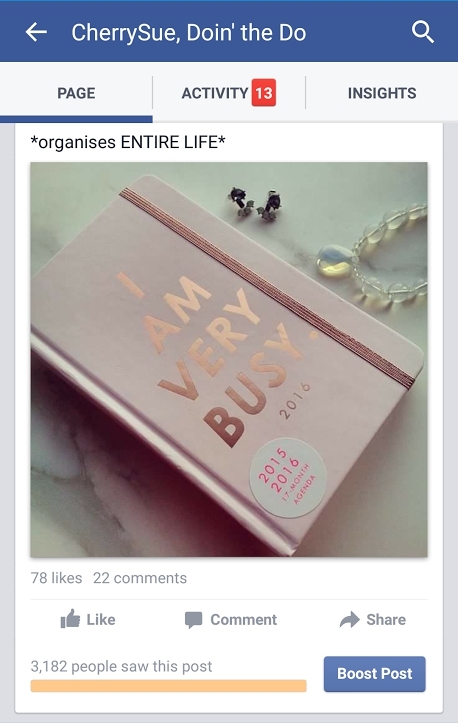 But isn't that what blogging is about? Not having to reinvent the 'behind the scenes' wheel so we can concentrate on being the ridiculously creative folk we are and producing better and better content to raise all of our games in every aspect of our lives. Do please feel free to share this post on your channels or tag pals you think would find my Facebook method helpful for their blog or business pages. I can feel that tide rising already!